William B. Donahue built at least five Northeast Portland Arts and Crafts bungalows between 1911-1915. 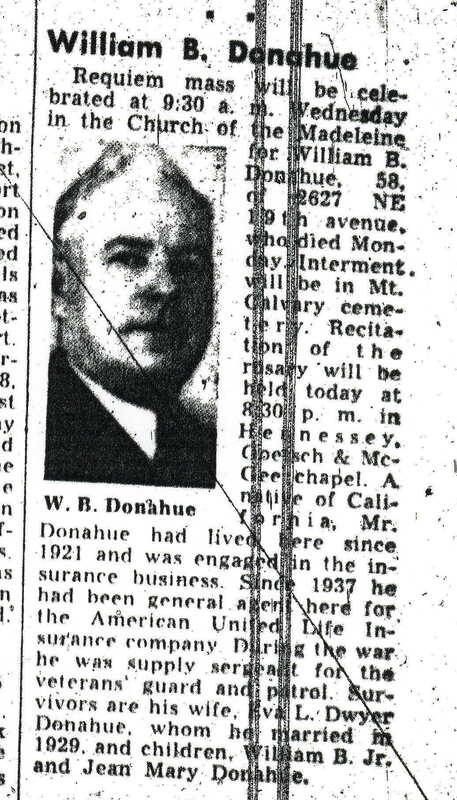 The son of Irish immigrants to California, Donahue was listed as a Portland carpenter and home builder in the 1910 federal census, but in 1921 traded his tools for the insurance business. While the origin of his house designs have yet to be established as clearly his own, each of the homes has distinctive features that unify them as being built by Donahue, ranging from the selection of hardware and construction materials, to decorative patterns used in exterior finishes and detailed interior woodwork. In the process of researching my own home, built by Donahue in 1912, I have found four others he built. I am actively seeking information on other homes built by Donahue and am researching leads to his descendents to seek personal information about his life and times. There are very likely other homes in the city built by Donahue. William Bernard Donahue was born in California on April 17, 1888 to parents James Donahue and Sarah Lavell Donahue[i]. The family moved to Oregon in 1895. Polk directories from 1904-1906 list a Wm. Donahue in various positions at the Oregon Railway and Navigation company (laborer, machinist, helper). Though not conclusive, this could be our subject. On August 1, 1909, Donahue married[ii] Bessie R. Lucky in a home at 1005 East 21st Street North (currently 4733 NE 21st Ave.[iii]). The 1910 census shows the newlyweds living in a home they own at 1027 E. 23rd Street North (4837 NE 23rd[iv]). Bessie’s mother was living with them at the time. A flurry of homebuilding followed in the next several years. According to building and plumbing permits, Donahue built the following homes. The original pre-1930 addresses are shown first, with current addresses shown in parenthese. The dates are final inspection dates by city inspectors. No plumbing or building permits exist for 836 E. Skidmore (2606 NE Skidmore), but it is certainly a Donahue, likely built from the same plans used to build 3404 NE 42nd Ave. Until the summer of 2004 this home had a concrete brick chimney with the exact distinctive exterior design as the one at 3404 NE 42nd. It is possible that the home at 740 E. 42nd St. N. (3424 NE 42nd) is a Donahue. The house was constructed at the same time (1912) and the appearance of similar-but not exact-materials and construction styles bolster this hypothesis. No original plumbing or construction permits exist for this home. An interesting commonality among these properties was their proximity to streetcar service to these neighborhoods: All are within a two-block walk of streetcar stops. This appears to be a deliberate and prudent business decision made by Donahue. The 1912 Polk Directory shows W.B. and Bessie living at 410 ½ Wasco (a duplex). Mutlnomah County records list both Donahues as owners of 869 East 30th Street North (4053 NE 30th). It’s hard to know exactly where the couple lived at that time. What is clear is that the first of their two children, William Bernard Donahue, Jr., was born on May 20, 1912. The teens show a constantly changing string of addresses for the Donahues, and what appears to be a break-up of their marriage. 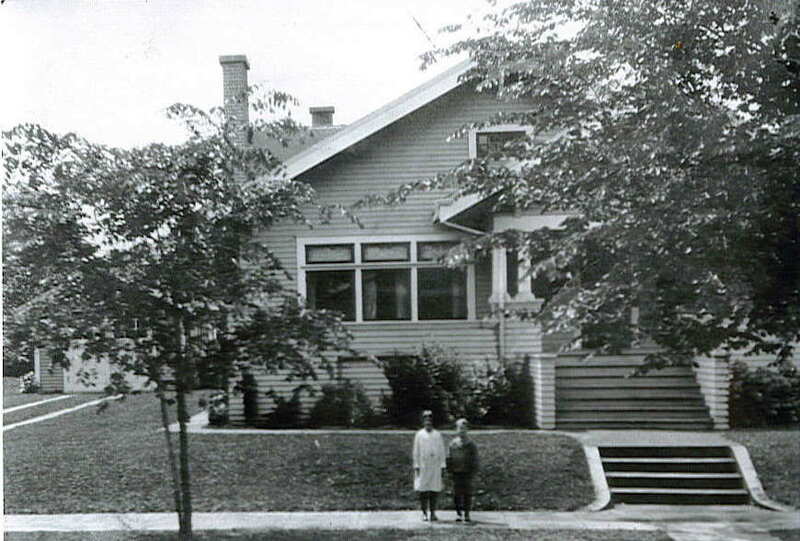 In 1913, they are together in the home at 734 E 42nd Street N (3404 NE 42nd). In 1914, they are at 869 E. 30th Street N (4053 NE 30th). The 1915 entry shows them at 250 Dixon, a duplex, which is currently a vacant lot at 401 N. Dixon. The 1916-17 entries show both Donahues at 564 Glisan, which no longer exists (between NE 13th and 14th, mid-block, south side of the street). In 1918, Bessie is living on her own at the Glisan address, and W.B. disappears from the Polk directories. When he does return to the Polk Directory in 1924, Donahue is listed as a solicitor for MetLife Insurance, with a residence at 996 E. 20th Street (4702 NE 20th). Curiously, though Bessie shows up alone in residence at various Northwest Portland addresses during these years, the 1924 entry for W.B. still indicates they are married. His location during these years is as yet unsubstantiated. Portland home construction did slow in 1918-1920 due to high inflation after the war years, which could strained Donahue’s business. My hunch is that he was here in Portland, but was simply missed by the directory. For whatever reason, Donahue made his career move in 1921[v] and stuck with it. In the 1920s he worked for MetLife Insurance and then for Mutual Trust Life Insurance of Illinois. In 1929 Donahue wed Eva Lee Dwyer and the couple moved among several addresses in Northeast Portland before settling into 2627 NE 19th Ave. in 1938. Sometime in the early 1930s Eva and W.B. had a daughter, Jean Mary Donahue Reeves. [vi] Shortly after moving into the home in NE 19th Avenue, W.B. switched to the American United Life Insurance Company, where he stayed as a general agent until his death in 1946. In addition to his insurance career, Donahue also served as supply sergeant for the Veterans’ Guard and Patrol during World War II. 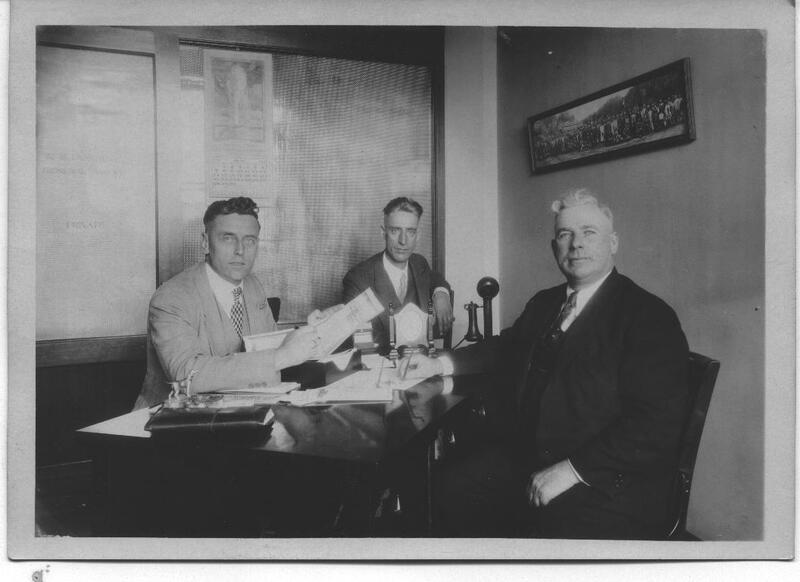 William Donahue in his later years, on the right, as an insurance agent for the American United Life Insurance Company. Photo courtesy of the Donahue Family, Author's Collection. Not much more is currently known about Donahue. The Morrison family, which bought the 30th Avenue house in 1918, often referred to their home as the “Irishman’s shanty,” a possible friendly reference to Donahue. Before their purchase, the Morrisons rented a home on Northeast 42nd Avenue just down the block from the other Donahue houses. Did they meet there? Continued genealogy may reveal more about Donahue. The houses, however, speak for themselves. [i] State of Oregon Death Certificate No. 2764, dated September 10, 1946. [ii] State of Oregon / Multnomah County Marriage Certificate No. 13213, recorded August 7, 1909. [iii] According to the original plumbing permit, the home at 4733 NE 21st was built in 1909 by Frank Warner. Master Plumber was J.A. Shoemaker. [v] Date supplied by family members for his 1946 obituary. [vi] From obituary information associated with the death of Eva Lee Donahue, died December 8, 1995. [vii] State of Oregon / Multnomah County Death Certificate 89-25039. 5 bedrooms and 2 baths?? Is there a copy available of the obituary of Eva Donahue? Thank you. I have information about Eva. Kathy, thanks so much for responding to my post! I would so love to know more about Eva. My email address is robinhanna@msn.com. Kathy, thought I would check in again. I would love to know more about Eva!! Kathy, I am still working away on family histroy and would love to fill in with more information about Eve. Does anyone have more information on W. B. Donahue Sr.’s parents James and Sarah? W. B. Donahue, Sr. is my Great Grandfather. Also, the connections I find for Eva Lee on Ancestry have her maiden name spelled as Dyer not Dwyer. Just curious if anyone has more detailed family info. I agree with Lef – and thank you so much, Doug, for the great family information! I am fairly certain that my grandfather was married to Eva for a short time after William died. I would love to find out more about Eva and share what I think I know with anyone who might be interested. Kathy Reeve, if you are Eva’s granddaughter, it would be great to hear from you! robinhanna@msn.com.